In 1881, the Wards moved to London, where Humphry had been taken on as a leader writer and art critic for The Times. Ward herself wrote for this and other newspapers and magazines, including Macmillan's. But now she made her first tentative foray into novel-writing. 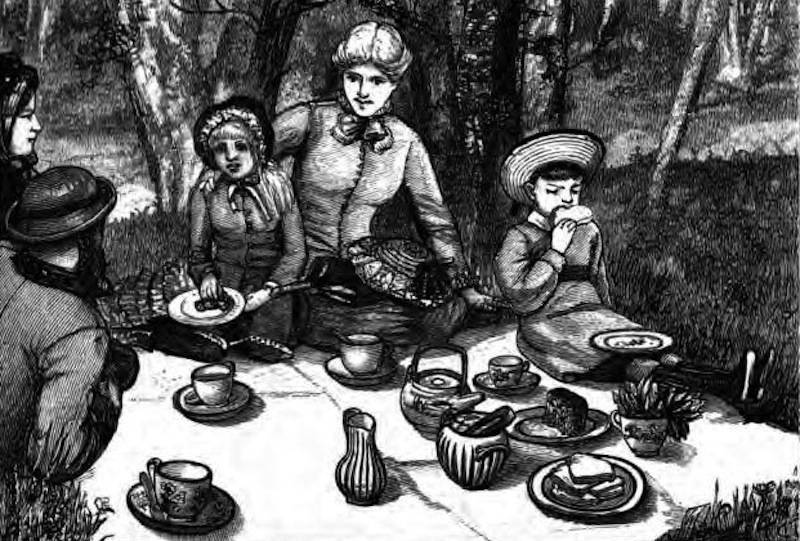 Macmillan's published Milly and Olly: or, A Holiday Among the Mountains for Christmas 1881. It was a children's story, in which her own childhood memories were overlaid with material from a recent and far jollier family visit to Fox How, here called Ravensnest. Conventional enough, except for the inclusion of a child's version of Beowulf which frightens the wits out of four-year-old Olly, it was nevertheless a start. This was followed in 1884 by her first adult novel, Miss Bretherton. Her inspiration here was the poor stage performance of an American actress in London, in a play she had gone to see with Henry James. Unfortunately, the novel was no more of a triumph than the play itself had been. But she continued to write, labouring now on the translation into English of Henri Frédéric Amiel's melancholy but inspiring Journal Intime. This finally came out in 1885, with Ward's own substantial and scholarly introduction and notes. It won the approval of Walter Pater, a close Brasenose connection of her husband, as "[e]asy, idiomatic, correct" (19), but fell short of her uncle Matthew Arnold's more exacting standards (see Sutherland, Mrs Humphry Ward, 100). After these false starts, success came to Ward at last with her next and still her best-known work, Robert Elsmere (1886). On a more serious subject than Miss Bretherton, and with some of the depth of Amiel's journal, it appealed to many more readers than her previous books. In fact, the story of the young Rector of Murewell, who is relentlessly exposed to the religious questionings of the time, gives up his living and takes himself off to the East End to open a Christian "Brotherhood" there, had a very specific resonance for the late Victorian period. It is instinct with feeling, too. In 1876, Ward's father Thomas Arnold had reconverted to Catholicism, again causing much distress to the family: in the novel, both Robert and his wife Catherine suffer from his crisis of faith very much as Ward's parents had done. The novel ends tragically, with Robert eventually working himself to death in the settlement's service, leaving his young widow to continue his charities despite her own staunch Anglicanism. Gladstone himself reviewed the novel at length in the Nineteenth Century. Despite thoroughly disapproving of Ward's premise that "the preternatural element" of Christianity was no longer tenable, and that the focus should now be on its social injunctions, he found much to commend in it, coming up with the "real though but partial consolation that, if the ancient and continuous creed of Christendom has slipped away from its place in Mrs. Ward's brilliant and subtle understanding, it has nevertheless by no means lost a true, if unacknowledged, hold upon the inner sanctuary of her heart" (17). At a time when many shared her doubts about the Christian faith, and were not as disturbed as Gladstone was about the assault on its dogma, the novel struck a real chord. It helped too that the whole idea of settlements among the inner city poor was gaining ground, even if this was a manifestation of the rising tide of socialism, for which Ward herself had no liking. The book was a huge best-seller. Indeed, John Sutherland describes it in his biography of Ward as "the best-seller of the century" (108), although elsewhere he has made the qualified and probably more reliable claim that it was "the best-selling 'quality' novel of the century" (Longman Companion, 539). It was devoured in America as well as Britain, and at home would inspire other East End novels, including, for example, Walter Besant's turn-of-the-century settlement novel, The Alabster Box — by this time, significantly enough, issues of class looming larger than those of religion. Left: Scenes from Ward's novels. Four are from David Grieve, which is set largely in the north of England. For example, the top one is Mermaid's Pool and the fourth is Fairbrook Clough, both in the Peak District. The remaining one, at the bottom, shows Torre Amiata from "the wondrous Italy of Eleanor" (Hamel 144). Source: Hamel 145. 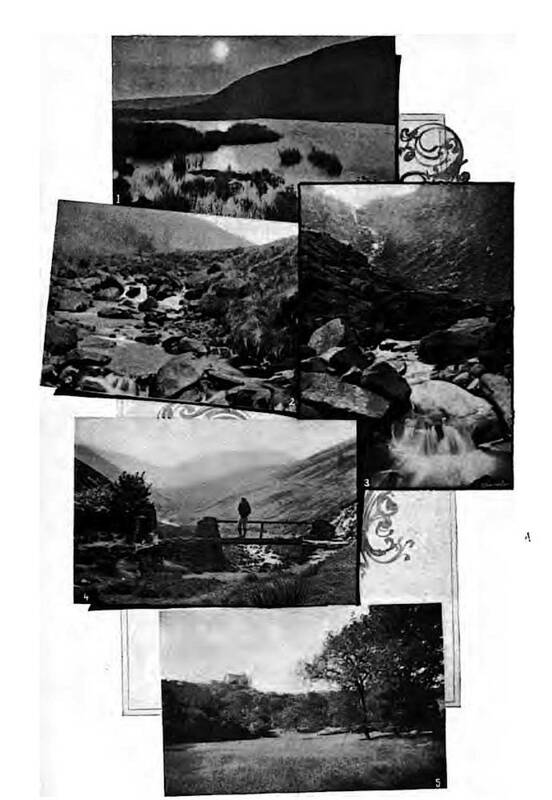 In 1903, when Hamel's article identifying favourite backdrops was published, Ward was still very popular. Writing with her finger on the (religious) pulse of her own time, Ward had made her name, or rather her husband's name, with Elsmere. Despite lifelong problems with writer's cramp, the equivalent of today's keyboard-generated problems, she began churning out novels at regular intervals. The next, The History of David Grieve (1892), with both regional and radical strands, and strong pepperings of passion as well as religion, sold well despite some biting criticism. Subsequent novels were now breathlessly anticipated, their appearance announced as the main news of the day. In the following decade or so, in rapid succession, came: the part-autobiographical Marcella (1894); The Story of Bessie Costrell (1895); Sir George Tressady (1896, a sequel to Marcella); Helbeck of Bannisdale (1898, one of her best, praised "without reserve" by the critical Stephen Gwynn, 65); Eleanor (1900, another big success); Lady Rose's Daughter (1903, the best-selling novel of that year in America); The Marriage of William Ashe (1905, again the best-seller of the year for fiction in America); and Fenwick's Career (1906), which sold nearly 65,000 advance copies (see Korda 3 and 10, and Sutherland, Mrs Humphry Ward, 270). Later novels included the anti-suffrage Testing of Diana Mallory (1908); a continuation of Robert Elsmere entitled The Case of Richard Meynell (1911); the rather feeble Mating of Lydia (1913); Lady Connie (1916), the successful war novel Missing (1917); and Harvest (1920). While these were all generally over-reliant on plot, Ward had not lost her passion for engaging in important social issues: in Harvest, for example, apart from violent crime, she deals with the new patterns of women's lives, and the changing face of rural England. In his biography of Ward, Sutherland calls the novel "extraordinarily interesting" (367). 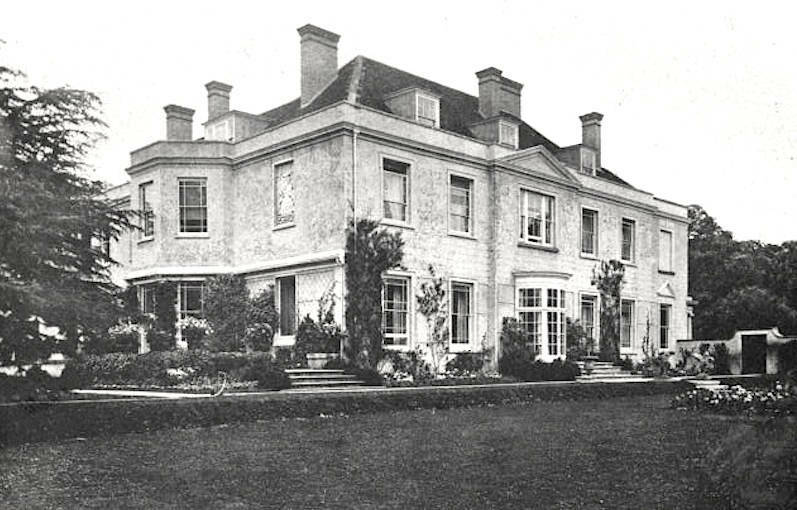 "Stocks, Mrs Ward's Country Home," which was constantly being expensively remodelled. Source: Writings of Mrs Humphry Ward, Vol. XIV, Houghton Mifflin ed., 1911, facing p.124. But public interest in Ward's work had begun to wane. She was not breaking new ground in her writing at a time when others were, giving rise to the "strange phenomenon of a late Victorian who was a regular target of anti-Victorianism" (Keating 177). Her literary conservatism has been blamed on her respect for such mentors and forebears as George Eliot, whom she had met and admired. There was also the not-so-minor matter of over-production mandated by greater financial burdens. 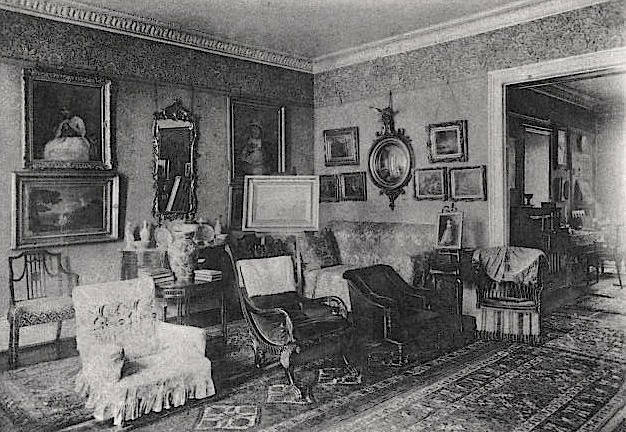 The Wards liked to entertain in style, and had moved to a posh house in Grosvenor Place in 1891. Stocks, their beloved country home at Aldbury near Tring in Hertfordshire, seems to have been the proverbial money-pit. What was more, in 1913 they had to bail out their son Arnold, who had developed a very serious gambling habit. To cap it all, Ward's bids to make a fortune from stage adaptations never paid off. She had to keep writing her novels, and this was no time to experiment with them, even had she wanted to. As time went by, even her themes began to stale: the burning issues of the late Victorian period no longer preoccupied her readership. Worse, on one of the newer issues in which she was engaged, women's right to vote, she was very much on the losing side. Her anti-suffrage stance clearly cost her many younger readers. In America, where she had once had an enormous following, the failure of The Case of Richard Meynell marked a precipitous decline in popularity. "Deeply regret to inform you your husband reported wounded and missing." 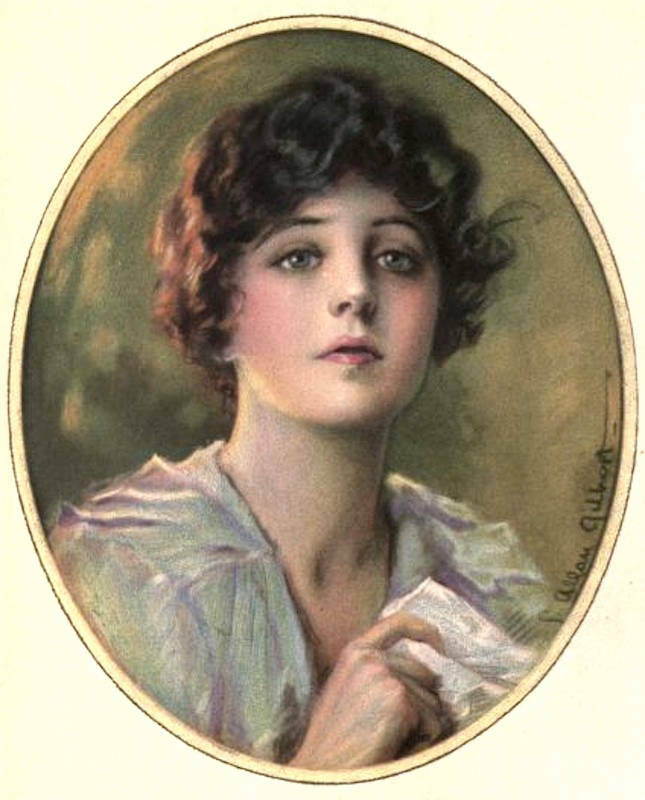 Source: Frontispiece, by C. Allan Gilbert, to Missing (1917), the poignant story of a young newly-wed's loss, which won Ward new acclaim towards the end of her writing career. However, Ward's visits to the trenches in France during the First World War resulted in three books of war reportage which, like Missing, did much to refresh her image. The best is probably the first, England's Effort — Six Letters to an American Friend, which she was encouraged to write by President Roosevelt (1916). Among the other costs of the "effort," she describes movingly the loss of many young men of all ranks, quoting not from Sassoon or Owen, but from Julian Grenfell from Balliol, whose poem "Into Battle," written just before he received his fatal wounds, told of fearless commitment rather than bitterness or pity. The other two books were Towards the Goal, with a foreword by Roosevelt, and in the form of letters to him (1917); and Fields of Victory (1919), complete with "illustrations, Coloured Map and Folding Statistical Chart," presenting "the true measure of the part played by the British Empire and the British Armies in the concluding campaigns of the war" (vii-viii). Ward calls at the end for a cessation of hatred and mistrust, and international co-operation in Europe. It was the last of her own personal contributions towards the war effort. By now her more personal Writer's Recollections had already come out. Here too she writes in a reconciliatory vein. Her unhappy childhood years were "no one's fault," she says. "My parents were very poor and perpetually in movement. Everybody did the best he could" (I: 134). As for her father's religious turmoils, she saw now that his Catholicism was the safe harbour to which he had needed to return. She had been touched when he and his second (Catholic) wife had visited her during a stay just outside Rome in 1899, giving him the chance to see the city with his own eyes, and "kneel in St Peter's" (II: 219) for the first time. She looked back now on his life as one of "constant labour and many baffled hopes," lit, however, by his faith and his love of scholarship and letters (II: 222). The book, serialised on both sides of the Atlantic, in Harper's Magazine in America and the Cornhill in Britain, was widely read. Gladstone, W. E. "Robert Elsmere" and the Battle of Belief. New York : Anson D. F. Randolph, . Internet Archive. Web. 3 November 2013. Gwynn, Stephen. Mrs. Humphry Ward. London: Nisbet, 1917. Internet Archive. Web. 3 November 2013. Hamel, F. "The Scenes of Mrs Humphry Ward's Novels." The Bookman: An Illustrated Magazine of Literature and Life. Vol. XVIII (September 1903-February 1904): September 1903: 144-151. Internet Archive. Web. 3 November 2013. Keating, Peter. The Haunted Study: A Social History of the English Novel, 1875-1914. London: Secker & Warburg, 1989. Print. Korda, Michael. Making the List: A Cultural History of the American Best-Seller, 1900-1999. New York: Barnes & Noble, 2001. Previewed on Google Books. Web. 3 November 2013. Pater, Walter. "Amiel's 'Journal Intime'" (Review). Essays from The Guardian. London: Macmillan, 1901. 19-37. Internet Archive. Web. 3 November 2013. Sutherland, John. The Longman Companion to Victorian Fiction. London: Longman, 1988. Print. _____. Mrs Humphry Ward: Eminent Victorian, Pre-Eminent Edwardian. Oxford: Clarendon Press, 1990. Print. Ward, Mrs. Humphry. Fields of Victory. New York: Scribner's, 1919. Internet Archive. Web. 3 November 2013. _____. Milly and Olly: or, A Holiday Among the Mountains. London: Macmillan, 1881. Internet Archive. Web. 3 November 2013. _____. Missing. New York: Dodd, Mead and Company, 1917. Internet Archive. Web. 3 November 2013. _____. A Writer's Recollections. Vol. I. New York and London: Harper, 1918. Internet Archive. Web. 3 November 2013. _____. A Writer's Recollections. Vol. II. New York and London: Harper, 1918. Internet Archive. Web. 3 November 2013. _____.Writings of Mrs Humphry Ward. Vol. II. Boston & New York: Houghton Mifflin, 1911. Internet Archive. Web. 3 November 2013. _____. Writings of Mrs Humphry Ward. Vol. XIV. Boston & New York: Houghton Mifflin, 1911. Internet Archive. Web. 3 November 2013.